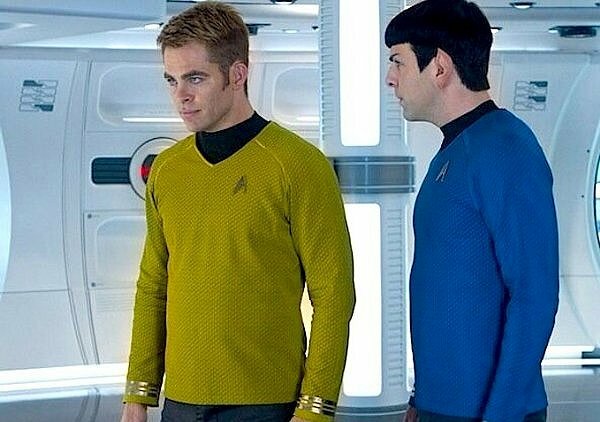 I felt left out back in 2009 when I ran into a number of people who thought the reboot of Star Trek was one of their best of the year, a movie I somehow failed to review back then. The reboot was definitely fun but it suffered from reboot-itis: a villain that could have been developed a lot better in the sea of “hey, let’s introduce you to all these people you loved in the original series!” and the curious idea that Captain Kirk is a natural-born leader because he never follows the rules, yet has all this amazing, surprising innate knowledge…sort of like a Patch Adams in space. Maybe I shouldn’t be comparing Captain Kirk to Patch Adams. But that’s the sort of thing we were expected to buy, without Robin Williams making it more annoying. J.J. Abrams is now the director of the new Star Wars coming up in a couple of years. Which means the most unbelievable crash of two franchises pitted against each other has happened. But Abrams has always been a little Trek and a little Wars in his approach: lots of action and lots of heady sci-fi converging together, not always successful but certainly always worth watching. This movie asks him to be both again. This time, a classic Star Trek story is given a twist and it’s going to put fans into a froth when they say what he’s done with it. Captain Kirk (Chris Pine) finds himself on a remote planet in the beginning of the film, and because of his ignorance of The Prime Directive, which is to not interfere with alien civilizations when exploring them, he at once does the right thing and the wrong thing: the wrong costing him his job as captain and the right proving a lesson to the logical Spock (Zachary Quinto). Christopher Pike (Bruce Greenwood) is to assume command of the U.S.S. Enterprise once again. Kirk is now a First Officer, takes orders from Admiral Alexander Marcus (Peter Weller, excellently cast). An attack by a former Starfleet agent named John Harrison (Benedict Cumberbatch, who is awesome), leads Marcus to re-assign Kirk to the Enterprise to go hunt down Harrison on Kronos, a Klingon planet where political strain could make a military extraction difficult. When Kirk and crew track down Harrison, he proves surprising: is he a good guy, or is he a bad guy being cooperative because he has larger, evil plans? I’m not going to say much more than that, because Star Trek: Into Darkness has a lot of surprises in store. It is action-packed, and its twist on a classic Star Trek story is multi-layered greatness: it not only flips the script on it, but it causes an amazing, absolutely amazing triangle of character flaws/traits working for/against each other between Kirk, Spock, and Harrison. Kirk’s rule-breaking, Spock’s logic, and Harrison’s strength all fight, help, and blend with each other in a finale that will have Trek fans clapping in the auditorium. You may have noticed I haven’t mentioned much about Uhura (Zoe Saldana), Scotty (Simon Pegg), Sulu (John Cho), Chekov (Anton Yelchin), and the absolutely gorgeous Alice Eve, but that is the movie’s strength: these characters are there and are put to good, supporting use, but we’re not inundated with their screen time just because they happen to be Star Trek staples, something the reboot could have used. The movie focuses on its main characters to tremendous effect. The more I think about Star Trek: Into Darkness, the more I like it. It’s rare we see movies that provide this much action and that much thought into the characters at the same time. It takes a plot point from the reboot and creates a world that is both old Trek and a new spin on Trek. The movie pays homage while carving out a new adventure. It’s clearly the best of the summer so far and one of the best of the year at this point in time. It’s fantastic.